Carpe Diem was the first boat of launched by Carpe Diem Fleet. It was built in 2008 to suit divers needs and requires. 10 cabins of Carpe Diem Liveaboard can welcome 20 divers and their fellow travelers. You can be sure that you will get comfort on board. Lower deck can offer accommodation in one of the six standard cabins, double cabins are placed on the main deck and suites and deluxe rooms are located on the upper deck. All they are has air conditioning and private showers. Also, each cabin has its own name, one of its called Salsa, another is Smile. Sun room situated on an upper deck and it is definitely sunny. Rooms are lights and spacious and bring you comfort that you expect from the trip. Carpe Diem Liveaboard has several areas for you to spend time in between dives. Diving area is open air, so you can appreciate stunning views of Maldives while meals are served. Lounge on the upper deck has entertainment facilities. Also many comfortable sitting places and coaches on other boat's decks. But you are on the boat in the middle of the Maldivian clear blue waters, what can be better than enjoy the gorgeous view on the sun deck. Carpe Diem dive deck equipped with Coltri compressors also there is a possibility of nitrox filling on board. To get to the dive sites boat has a tender and a small speedboat. Rent of Scuba Pro dive gear is available on board of Carpe Diem. Carpe Diem's team care about your safety. All needed equipment is on board: Smoke detectors, fire extinguishers, life jackets, emergency alarm. Carpe Diem Liveaboard has 3 dive guides, so divers can be separated into small teams by their level of experience. Every crew team member has many years of diving on the Maldives. The have dedicated their careers to diving in this beautiful place. Each diver on a board of Carpe Diem will get personal care. 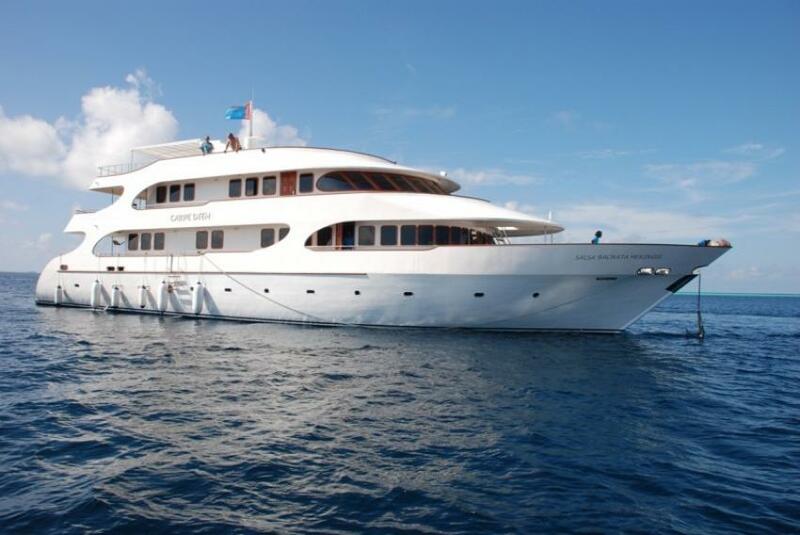 Carpe Diem Liveaboard can offer a wide range of routes including South, Deep South and North of Maldives. These itineraries are still not explored until the end. Also, there are not too many divers in these areas so you can see all the underwater treasures, untouched coral reef and lots of pelagic animals attracted by plankton. Carpe Diem itineraries include famous dive site of Maldives. During the safari, you will visit Baa and Lhaviyani Atoll, Ari Atoll and observe Manta Rays. Dive spots and lagoons where mantas can be often meet will be visited while you are on a board of Carpe diem. They will be flying around you like giant birds with their giant wings. Baa and Lhaviyani represented by thousands of coral reefs and a variety of fish. Don’t miss a chance to dive with whale sharks in crystal waters of Maldives. High season for diving on Maldives begins in December and end in May. But diving here is available all year round because of good visibility and water temperature, that is usually around 26 to 29C.